Are you New to Canada? Perhaps a new job or recent divorce? Have you established good credit, bad credit or even no credit history? No Problem! 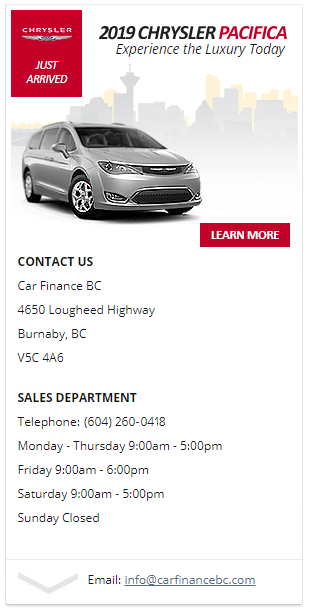 Our trained specialists will help tailor a car loan and payment plan structure that works for you. Learn more about our Fast Approval Process and 99% Acceptance Rates apply today! Large selection of inventory (fully stocked) inventory of over 1,100 (new and pre-owned) vehicles to choose from (via our Carter Auto Group) including; Sedans (Chevrolet Camaro,Corvette, Chevrolet Cruze, Malibu, Cadillac ATS, Buick Regal GS, Chrysler 200s, Dodge Charger and LaCrosse), SUVs (Chevrolet Suburban, Tahoe, Buick Enclave, GMC Acadia Denali, Encore, Envision, Cadillac Escalade, XT5, Jeep Wrangler, Compass and Grand Cherokee), Compacts (Fiat 500, Chevrolet Sonic, Spark and Electric Volt), Trucks (Ram 1500, Chevrolet Colorado, Silverado and GMC Canyon) and Commercial Vans (Chevrolet Express, GMC Savana, Ram Promaster and Promaster City). Our dedicated team of qualified leasing specialists works diligently to secure our customers vehicle of choice – while catering closely to all individual budgetary requirements!